A new door has opened at The Lost Dogs’ Home, and enormous promise and excitement is in the air as the new Frank Samways Veterinary Clinic prepares to welcome its first patients on Friday, 21 December. Here at The Lost Dogs’ Home, we have a long tradition of providing quality veterinary care for the animals who find themselves in need of treatment and some TLC, as well as the beloved pets of people within the wider community. But, growth is something we are always ready to embrace, and the opportunity for the Home to be able to stretch its legs into a newly developed, high quality vet clinic is a wonderful thing. Frank Samways was a man with a simple appreciation for our four-legged companions and the joys they bring to their owners. The Home’s new vet clinic proudly bears his name, as a perfect legacy to the animals he loved so well in life. Through our ongoing work at the clinic, he will continue to touch the lives of dogs and cats well into the future. We’re sure Frank would be thrilled to see the stunning facility as it welcomes its first patients, and we’re certain it will also gain the seal of approval from even the most haughty of cats or dogs. One of the most important things the new clinic will enable is the extension of opening hours for greater convenience. Our old faithful clinic did indeed suffer from some limitations, opening at 10am during the week, which was often too late for clients wishing to drop their pets off for surgery before work. The Clinic’s new opening hours can be found below along with this year’s Christmas hours. The Frank Samways Veterinary Clinic is in itself a magnificent feat of modern design, while it maintains a focus on the practicalities and logistics of keeping animals calm and happy, as they come in for everything from basic check-ups and vaccinations, to more involved treatments and surgery. With an eye ever-on practicality, the new clinic is also accompanied by one of the most increasingly sought-after treasures in Melbourne, that of off-street parking. We know how difficult it can be to find space to park in such a busy area as that which surrounds our facilities in North Melbourne’s Gracie Street, and how stressful it can be when you have an elderly, unwell or convalescing pet to transport. While the clinic is not only a tremendous boon for the pets it will treat, it will provide a continuing source of benefit to the thousands of lost and stray animals which come through our doors each year. All proceeds from the new facility will go directly into funding services provided by The Lost Dogs’ Home’s to the animals who find themselves lost and abandoned, and are in pressing need of our care. The veterinary staff at the Home are looking forward to being available for more pet owners and their animals, and providing their signature genuine sensitivity and compassion. When they were canvassed for their opinions on the new facility which they will very soon see humming with life and activity, their responses were varied, but all imbued with the same impressions of achievement and wonder. “It will provide more efficient, better quality care to the animals, and diagnostic services will be faster,” one testimonial said. “It lives up to the level of care and professionalism of the vet clinic team,” another remarked. “There will be less stress on the dogs and cats that visit, as we have dedicated separate areas for them, unlike in the old clinic,” – news which will surely have cats rejoicing anew! “With dedicated surgeries and an extra consult room, as well as being larger and more modern in their outfit, it means less waiting for customers too,” one vet said. What it also is, of course, is a physical testament to the generosity of the Home’s benefactors and supporters, and what their loyalty and support make possible. The new clinic stands as a reminder to everyone at the Home, and hopefully everyone who from here forward has cause to visit, of the very real impact donors have on organisations such as ours, and thus on the lives of the animals we care for. Frank Samways’ gift is representative of the countless others who give so much to the Home, so that we may continue to do our best for animals in need. For appointments please phone 9329 2755. 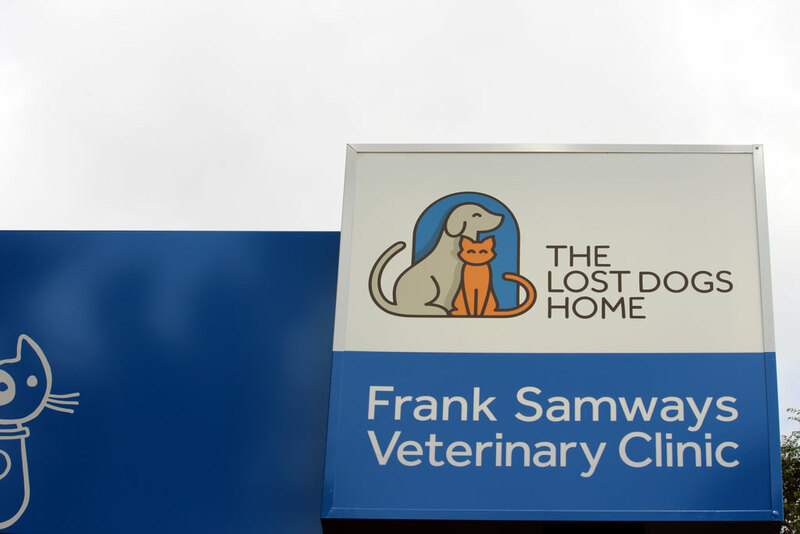 The Lost Dogs’ Home Frank Samways Veterinary Clinic is a 30 second walk, across the road from the Shelter in Gracie Street.